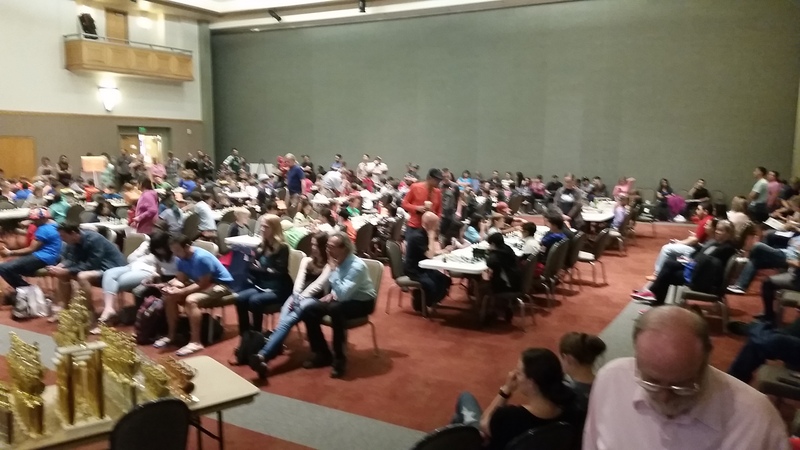 On April 10th, 2016, 290 students from elementary and community schools all over Central New Mexico showed up to represent their school chess team in the Student Union Building at UNM. They played in 6 different divisions: Leaders A, Leaders B, Leaders C, Leaders D, Learners A, and Learners B. All of our Leaders section participating teams were top teams from their school and our Learners teams were 2nd, 3rd, and 4th teams from their school. The Leaders A section was comprised of four teams that won their Fall regional and four others selected by Learners’ coaches. 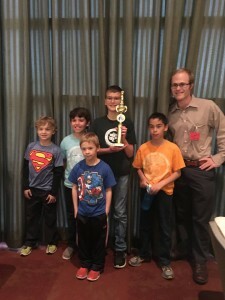 After three rounds the Monte Vista Penguins defended their championship from last year, winning all three of their matches defeating the Northwest/ Rio Rancho Regional champions, Seven Bar Wrangler in round 1. 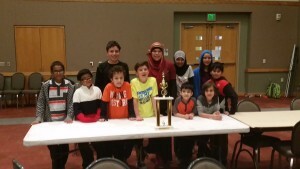 In round 2, the Penguins na rrowly defeated the second place team on the day, Salam Academy, by a score of 3-2. And in the final round, the Penguins defeated the young and talented Georgia O’Keeffe Rams, again by a score of 3-2. 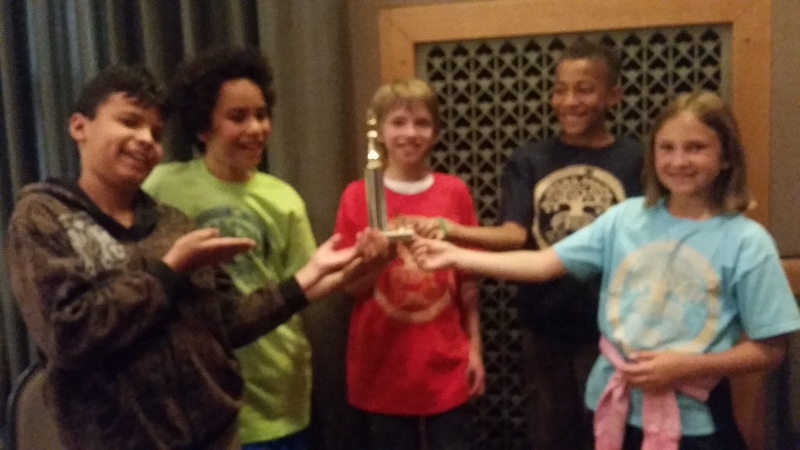 The Penguins are led by a trio of very talented 5th graders: Massimo Lapina, Phillip Bosin, and Ethan Smith. Salam Academy impressively edged out the third place San Antonito Roadrunners. Both teams scored two match points, but Salam edged San Antonito in game points, 9 to 8.5. Salm defeated the Rio Grande Valley regional cahmpions, Escuela del Sol in round 1, 4-1. And in round three Salam defeated the NE Heights regional Champion North Star Wolves, 3-2. 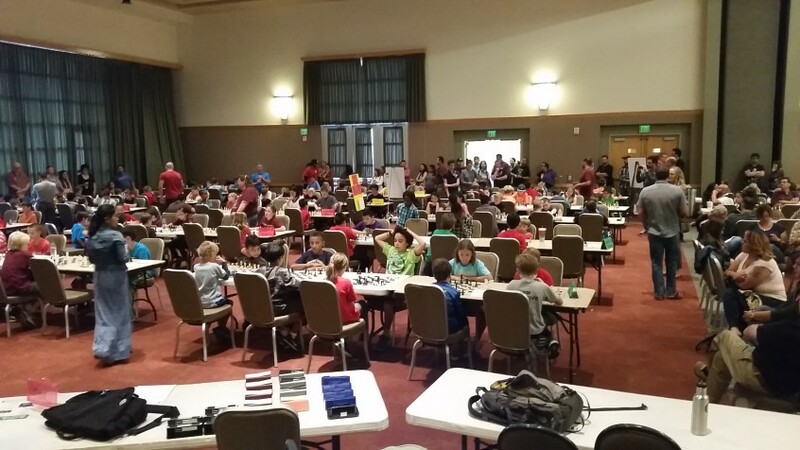 San Antonito was the only team besides Monte Vista to not lose a match on the day as they won a match against the Bandelier Bears and drew matches against North Star and Escuela del Sol. Escuela del Sol, in their first year competing in the Leaders A Division finished in 4th place having earned 1.5 match points and 8.5 game points) having defeated the Seven Bar Wranglers and also having drawn with San Antonito. North Star (5th with 1.5 match points and 7.5 game points), Georgia O’Keeffe (6th with 1 match point and 8.5 game points), Bandelier (7th with 1 match points and 7 game points), and Seven Bar (8th) rounded out the top eight teams in the tournament’s Leaders A division. 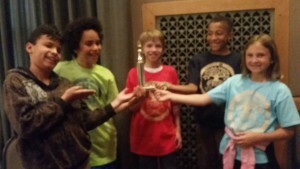 The Leaders B section was comprised of teams who finished well in their regionals and were selected by Learners’ coaches. The Alice King Roadrunners, who have ambitiously worked for the past three years on their improvement impressively won the Leaders B division winning all three of their matches and scoring 11.5 game points. In round 1, they defeated the eventual 2nd place team, Cien Aguas, 3.5 to 1.5. In round 2, they defeated the Northwest/ Rio Rancho regional runners up, the Sandia Vista Thunder. And in the last round they defeated the St. Charles Cardinals. Cien Aguas placed second (2 match points and 10 game points) having defeated New Mexico International, 5 to 0 and Hubert Humphrey, 3.5 to 1.5. finishing in third place was Double Eagle who scored 2 match points and 8 game points, having defeated St. Charles and Sandia Vista. Hubert Humphrey, with 2 match points and 7.5 game points finished in 4th place having defeated Double Eagle and St. Thomas Aquinas. Rounding out the section was St. Thomas Aquinas (5th with 1 match point and 9 game points), Sandia Vista (6th with 1 match point and 8 game points), St. Charles (7th with 1 match point and 5 game points), and New Mexico International in 8th place. Our Leaders C section was comprised of teams who finished in the middle of the pack in their regional tournament last Fall. In the Leaders C section, the Maggie Cordova Dragons, another team who has worked for over three years on their steady improvement as a club, finished undefeated in match points to take 1st place. The Dragons defeated the tied for 2nd place Marie Hughes Huskies in round 1, 3-2. in round 2, they defeated the Zuni Eagles, 3-2. And in the 3rd round, they defeated the Chamiza Conejos, 4-1. Tying for second place with 2 match points and 10 game points each were the Coral SeaKnights and the Marie Hughes Huskies. Marie Hughes defeated the Cielo Azul Ravens and Coral, while Coral defeated Chamiza and the Griegos Mustangs. Griegos finished in 4th having won 2 match points and 7.5 game points. In 5th-8th were: Chamiza with 1 match point and 7 game points, Zuni with 1 match point and 6.5 game points, the Zia Eagles with 1 match point and 5 game points, and Cielo Azul. 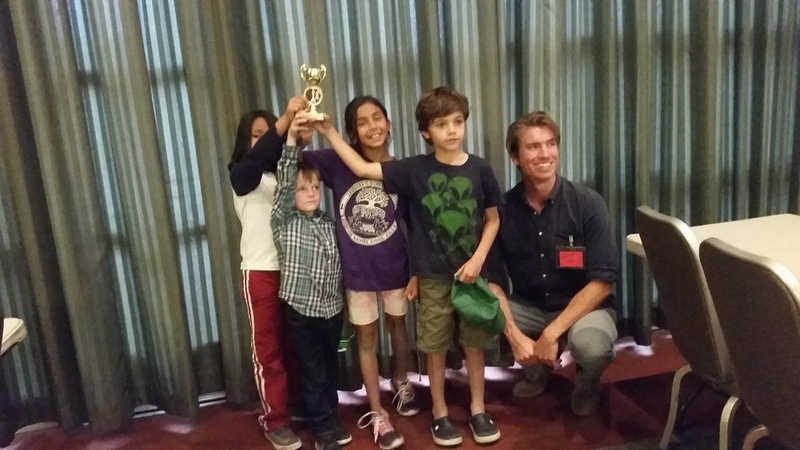 The Leaders D section was comprised of ten teams who finished in the lower tier of their regional and teams who are in their first year of having a chess club. 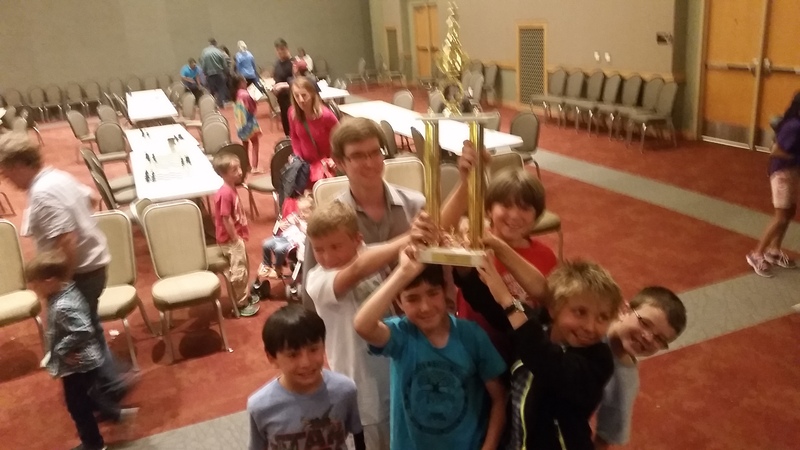 Winning the section was our first year club, the Montessori School. TMS defeated Holy Ghost, drew with E Stapleton, and defeated Mountain Mahogany to earn 2.5 match points and 10.5 game points on the day. 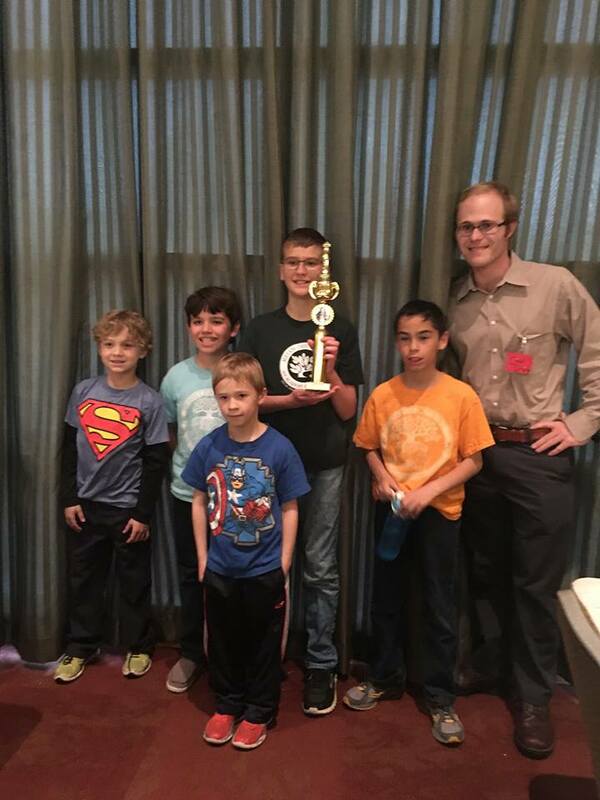 Just behind TMES for 2nd place was the E Stapleton Coyotes, who drew with TMES and defeated Montessori of the Rio Grande and the Alvarado All Stars to earn 2.5 match points and 9.5 game points. The Mountain Mahogany Knights and the Manzano Mesa Meerkats finished tied for 3rd place with 2 match points and 9 games points each. And just behind them finishing 5th was the Alvarado All Stars, who fished with 2 match points and 8.5 game points. Pajarito finished in 6th place with 1 match point and 7.5 game points. They were followed by Holy Ghost, Montessori of the Rio Grande, Arroyo del Oso, and Ventana Ranch. The Learners section is the place to look for young players who will be competing on their first teams next year. The Learners sections proved to end up being quite a task to get organized. When we finally sat down all the teams, the section of 14 teams was led by Salam Academy’s team 2 and team 3 who both tied for first place with 3 match points and 12 game points. In 3rd was the Bandelier Bears 2nd team, follow by the Georgia O’Keeffe Rams 2nd team who finished in 4th place. Monte Vista’s 2nd team placed 5th and was follow by: 6th place Griegos team 2, 7th place North Star team 2, and 8th place Escuela del Sol team 2. tied for 9th place was San Antonito team 2 and Cien Aguas team 2. In 11th was Arroyo del Oso team 2 and in 12th was Maggie Cordova team 2. 13th and 14th were two house teams that were comprised of extra players. 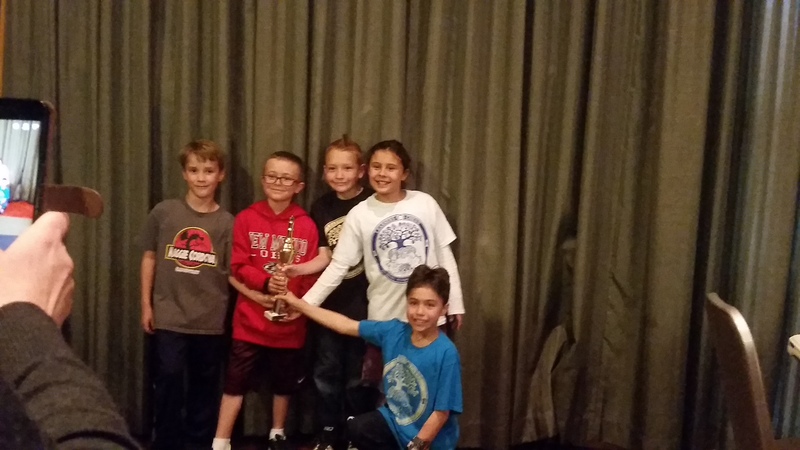 The Learners B section was won by Monte Vista team 3 who went undefeated with 3 match points and scored 13.5 out 15 possible game points. Also undefeated was Alice King’s team 2, who scored 3 match points and 10 game points. Holy Ghost team 2 and Georgia O’Keeffe team 3 tied for third with 2 match points and 8.5 game points each. They were followed by 5th place Sandia Vista team 2 and 6th place was another house team, the Mighty Anchovies. Tied for 7th was a combination team of Tierra Antigua and E Stapleton extras and Salam team 4. The Montessori School team 2 got 9th and Alvarado team 2 got 10th.